Stronger connections for the ferry - more service, extend hours. New ferry terminal should improve bike access and connections to bus and streetcar. An especially important route for service industry and hospital workers. 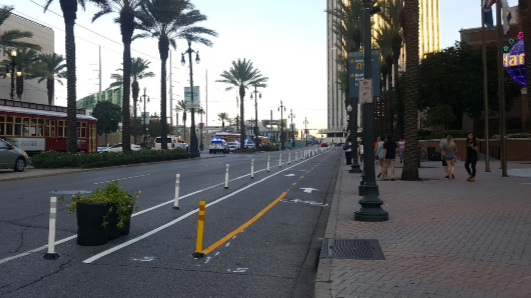 There was concern about the interchange at Tchoupitoulas at Canal Street, and the turns onto and from Common and Gravier. However, bikers, walkers, and drivers seemed to navigate these intersections without much issue. This route’s utility was somewhat diminished when the Decatur/North Peters center-running protected bikeway installation was cancelled. Connect The Crescent is a project of Bike Easy and a coalition of other partners.